With Gen Con around the corner and the Spiel Games Fair in autumn, I was missing the good old days when we could play the Shadowlands Horde or the Spider Clan. So to get more into the relaunch hype, I asked the talented Troy Graham of L5R fame to do a commission for me, and he was so kind as to accept. What can I say? It's turned out awesome. I'm blown away by it and just must share it with you. The piece is a collaboration of Troy's and my ideas. 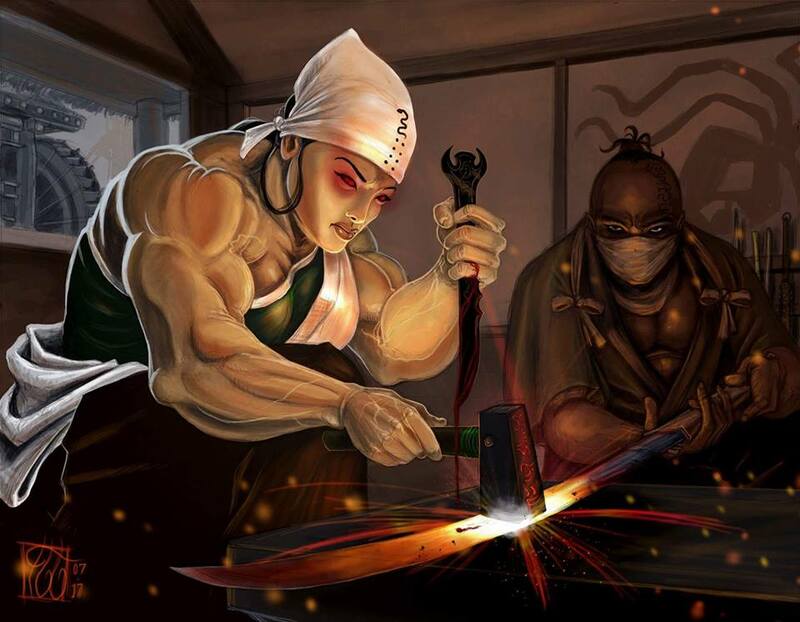 It shows a strong and powerful Gyushi blacksmith. That's the Daigotsu vassal family of Chuda lineage that was introduced in the Book of Earth. The weaponsmith in her forge clearly is a shugenja, knows her maho and has Hida blood, is perhaps a Crab convert or married in. The snake on her bandana is a reference to the Snake Clan the vassal family comes from, and the tetsubo at the forges wall references the Crab Clan.